Our next family social will be a potluck dinner on February 21st. Check out the flyer below. Please note that this is a members only social. If you are interested in coming, please call (201-301-2816) or email (NewJersey@AdoptiveParents.org) for details on how to join APC NJ and to get all the details about the dinner. It's a great event for both pre and post adopt families, as we all share our family stories. Please set aside the evening of February 21st and join us at our Potluck dinner. Invitations will be emailed shortly to all our members. Contact us to join APC and be part of the fun on February 21st. Next meeting - January 17th! Happy New year! Now that it's January, we want to remind you that our January meeting is coming up soon on January 17th. SPECIAL TIME 2:30-4:30 pm - SPECIAL LOCATION Ridgewood Public Library. Learn all about NJ's new adoption law. We are excited about this collaboration between the NJCARE, the Ridgewood Public Library, and APC. There will be a special screening of “A Simple Piece of Paper,” a video about the release of birth records for adoptees in Illinois. Pam Hasegawa from NJCARE, who was instrumental in getting a similar law passed in NJ, will be with us to talk about the video and the NJ law. You can get info on this organization and their work. You can get the exact address and scroll down to see the announcement of this event with a detailed flyer. Scroll further down this page to see our regular flyer with all the details. Looking forward to seeing you there. January is just around the corner! Mark your calendars now! Learn all about NJ's new adoption law! 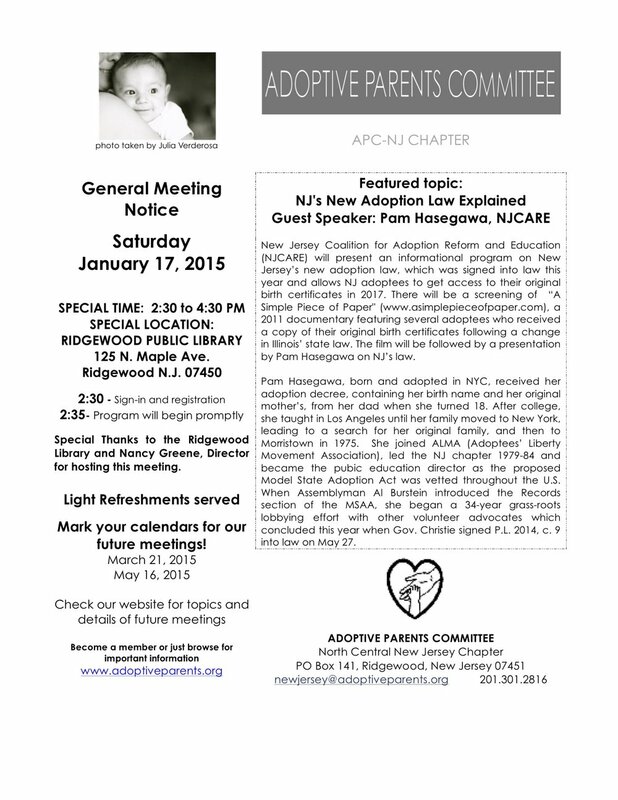 We are excited about this collaboration between NJCARE, the Ridgewood Public Library, and APC for NJ APC's January General meeting on January 17th, 2015. SPECIAL TIME - SPECIAL LOCATION See the flyer for al lthe details! The Giving Tree is a NJ APC tradition. We have 80 children in foster care on our lists from Children’s Aid and Family Service who have made holiday gift wishes. In addition, the children from Youth Consultation Service look forward to dinner and a movies that APC donates for an after the holidays treat. We will also be collecting new comforters for boys and girls, ages 6-12, and teenage boys and girls. Fun pillows and pillow pets will also help to beautify their rooms. Many gifts still need to be purchased. If you would like to chose to purchase a gift for a specfic child or make a monetary donation, please call NJ APC at 201-301-2816 or email newjersey@adoptiveparents.org. Monetary gifts can be sent to APC NJ PO Box 141, Ridgewood, NJ 07451. All gifts must be received by December 16th. Lively games lead by a very energetic clown, pretend sword fights with balloon creations, and animals from tigers to sharks being painted on hands and arms and faces, were enjoyed by all our young attendees. And our newest arrival, at 7 weeks, peacefully slept through it all! Many thanks to Laura, our social events coordinator, for lining up the entertainment and ordering the delicious food. And thanks to all the families for bringing some fabulous desserts! Join us for a fun, family afternoon at our annual Holiday Party! See all the detials on the flyer below. Everyone who attended our meeting this past Saturday evening, I'm sure would agree is was very informative and enjoyable. Stefani had her "magic suitcase" of books with her and had books on every adoption topic imaginable. The ages of the children of the attendees were quite varied as well as the questions each family had. Stefani had books to meet everyone's needs as well as helpful advice on how to use them to address the needs of adopted children. Stefani guided us as we all shared our experiences, doubts, hopes, and dreams and gave us insight and the words to use with our children. She truly put the support in support group! We also want to thank Kelly Haggerty allowing us to use her office for our meeting. If you would like to receive the resources Stefani shared with us, please contact us and we will email them to you. Join us as Stefani Moon discusses the use of books for children and adults in all stages of the adoption process. Stefani is one of our popular conference speakers, but you can hear her in a smaller, more personal setting. Stefani, who is a licensed professional counselor and an adoptive parent, has spoken at one of our meetings before and brought great energy and knowledge to her presentations. Check out the flyer below to get details on day, time, and our NEW location. Everyone who attended the combined family social and general meeting in September, had a great time! Thanks go out to Maureen McLaughlin and her colleague Margaret for guiding the families through the creation of a family portrait and providing us with a great jumping off point for future family discussions. Thanks also to Maureen (membership) and her husband Bob for designing the flyer and getting the word out to the membership, to Ron (treasurer) for setting up the online registration and collecting the money, and to Laura (social) for taking care of all the details that went into making the evening run smoothly – and that we had a variety of foods to eat! And finally, I would like to say that all the dishes the attendees brought to the potluck were delicious! We're Back! Plan to Join Us on September 13th! Hope you've had a great summer! The NJ Chapter Board has been busy planning our meetings and social events for the upcoming year. And we're starting off our year with a combined meeting and social event. We are going to have our 2nd annual Fall Poluck Family Dinner on September 13th. For those of you who joined us last year for the 1st fall social, it will be in the same place - Wyckoff Reformed Church, Wyckoff, NJ. After the dinner, APC member and art threapist Maureen McLaughlin will lead the interactive family meeting "A Family Portrait." You can get all the information on the flyer below. Registration is a must, so go to the following link to sign up. We are very grateful to Rita for sharing her time and expertise with us. She shared a great deal of information with us and answered numerous questions for the attendees. If you are interested in the resources Rita shared with us, please email or call the NJ chapter. We hope you can join us for this very informative evening. You may be thinking, "Wouldn't a school topic be more timely in September?" And the answer would be, "Our September meeting will be too late.” To help your child have a smooth beginning in September, you need to prepare yourself NOW for choosing a preschool, getting your child ready for kindergarten, or talking to your child’s teacher about next year’s placement. Hope to see you there! What a great day we had today at the farm! The children enjoyed seeing and feeding lots of different animals, exploring new play areas, riding on the train, and traveling by a tractor pulled wagon to the barn for snacks and crafts. We had many returning families as well as several new families who enjoyed sharing their experiences and stories. Many thanks to Laura our social chair and her husband Ken for taking care of all the details which made this day a success along with thanks to Ron our treasurer for taking care of the registration and collecting the admission fee. Family Fun Day - A Day At the Farm! Our next fun family event is coming up soon! All who attended last year had a great time. Be sure to register by clicking on the following link: http://fs19.formsite.com/apcnj/farm/ You need to be a member of one of the APC chapters to attend. Please send us an email at newjersey@adoptiveparents.org if you would like membership info. What a great presentation last night! So much good information for all the stages of the pre-adoption journey and a great perspective on the long range goals for having a child in your life. Many thanks to Amanda Grtant for sharing her expertise with us. Visit her at USAdopt for more information, to read her blog, and to find her contact information. At our March meeting Amanda Grant, President & CEO of USAdopt, LLC is going to give her presentation, “An Adoption For Every Budget.” I talked to Amanda recently to find out a little more about Amanda and this hot topic. Lorraine: I mentioned in the lead-in to the meeting flyer [below this interview], that when you gave this presentation at the conference, it was standing room only. Why do you think this is such a popular topic? Amanda: Perceived and real expenses are often the first obstacle, the first reason, why people don’t pursue, or give up on, adoption as a way to build their families. They are intrigued by the concept of an “affordable” adoption. I guarantee everyone who attends, will walk away with knowledge they didn’t have before about how this can be affordable. Lorraine: When we were chatting at the NJ holiday party, you mentioned that you enjoy giving this particular presentation. Amanda: Yes, I enjoy giving this presentation because, I have found in one hour, I can change the course of people’s lives. I’ve had people come up to me afterwards and tell me that they now believe they can do this. Lorraine: In the description of this presentation, you say you will talk about “creative fundraising.” Can you give us one example of a creative fundraising idea? Amanda: You need to think of your gifts and what you have to offer people. I have one client who is a musician, and she is holding a concert and selling tickets to raise money for her adoption. Lorraine: Is this a presentation just for pre adopt parents? Are there points in your presentation that would be valuable for post adopt families also? Amanda: This presentation is good for people who are just beginning to think about adoption, those who are mid-process, and for those who have finalized in the last year. The pre adopt parents not only need to prepare for the adoption process, but also for after the adoption – the rest of your family life. For those who have recently adopted, tax season is coming and you can find out about the multiple credits that are available to you. Join us for "An Adoption For Every Budget." Our speaker, Amanda Grant, gave this same presentation at the big NY conference in November, and the session was standing room only! She is a member of our NJ chapter and has agreed share her knowledge and expertise again. Check out the flyer below for all the details.